Kirkintilloch Rob Roy have gone through to the knockout stages of the Euroscot Eng Sectional League Cup - at the expense of holders Cumbernauld United. 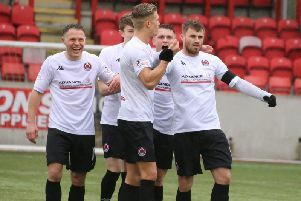 Rabs booked their place in the last eight with a goalless draw at Kilsyth Rangers in their final group match on Wednesday night, following wins in their first three games. The point ensured the Kirkintilloch side can’t be caught at the top of the section. In contrast with the stalemate at Duncansfield, the other group match saw Rossvale hit the goal trail as they thrashed Dunipace 7-0 away from home, equalling their record win. Fraser Team hit a hat-trick and Jason McKay netted twice while Cassells and Coll were also on target. The final section games on Saturday will see Rossvale play Cumbernauld at Petershill while Kilsyth are at home to Dunipace. Elsewhere Thorniewood - group winners 12 months ago - completed a miserable campaign this time round when they lost 3-2 at home to St Roch’s, ensuring they will finish bottom after losing all four matches. Bellshill, who had no game on Wednesday, complete their section games at home to Petershill on Saturday as they make their long-awaited return to Bellshill. Lesmahagow’s hopes of winning Section 1 were dealt a hammer blow when they lost 4-2 at home to Larkhall Thistle on Wednesday. Larkhall have completed their matches while ‘Gow have one game to play but will need to win by eight goals at Forth on Saturday to have any chance of progress. Lanark beat Forth Wanderers 3-1 and could also still win the group, but like Lesmahagow they are three points behind Larkhall with a game to play and require a six-goal winning margin at Royal Albert to overhaul the group leaders. In Section 2 Carluke Rovers still have an outside chance of progress but require results to go their way tomorrow. Carluke play their final match at home to Newmains on Saturday and need to win and hope that leaders Gartcairn slip up at Wishaw. If Wishaw win Carluke will have to beat Newmains by one more goal than Wishaw defeat Gartcairn - if Gartcairn get a draw Carluke will have to win by at least five goals to progress. The league season for all West Region junior sides starts next Saturday, August 29.